When Champlain returned to Quebec in 1633, he found that the settlement had been largely destroyed during the English occupation and immediately set about rebuilding and repairing its structures of defence, trade and habitation. He also built a new chapel for the settlement and named it Notre-Dame-de-la-Recouvrance. From a spiritual perspective, much was done to revive religion in the settlement, and Champlain cultivated relationships of support and friendship with a number of the Jesuit fathers living there. He worked again to repair frayed relationships with his Aboriginal allies. In the summer of 1633, a large group of Huron (Wendat) travelled to Quebec with a substantial volume of furs to trade with the French, ensuring a profitable year for the settlement. In an attempt to safeguard trade from intrusions and attacks by the Iroquois (Haudenosaunee) nations, Champlain built a fort at Trois-Rivières at the mouth of the Saint-Maurice River in 1634. The fort also served to secure trade with Algonquin (Anishinabe) nations, which otherwise might have pursued trade with the English if forced to travel to Quebec to trade with the French. Settlement was also a priority, and during this period, land in the St. Lawrence Valley began to be divided into seigneuries – long narrow strips of land that extended outward from the banks of the St. Lawrence River. This system of land distribution was intended to encourage people with means to assume the financial risk of recruiting settlers to farm the land, thus contributing to the development and growth of a successful agricultural colony. 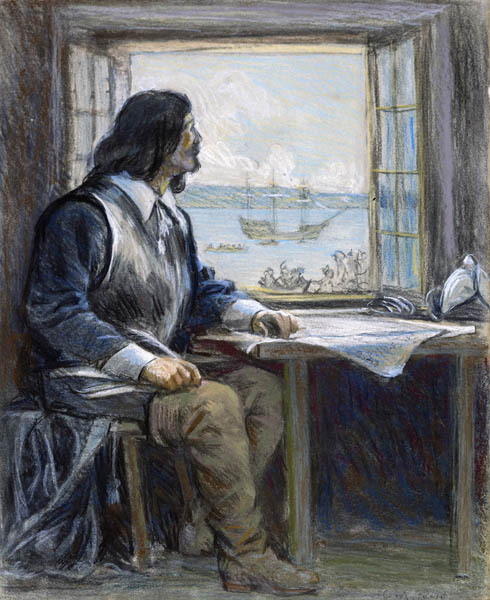 In the fall of 1635, Champlain fell ill and spent his last days at Quebec, putting his affairs in order and reaffirming his commitment to the Catholic faith. He died on December 25, 1635, and was mourned by all members of the settlement and his Aboriginal allies. He is remembered for his unyielding commitment to the establishment of a permanent French colony in North America.